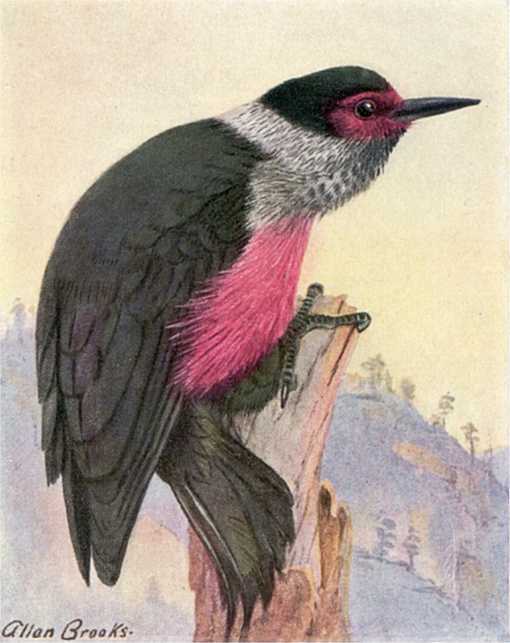 A large woodpecker; 10 – 11 inches long. Upper parts, wings and tail green black with bronze luster. Dark crimson face. Narrow distinct collar around back of neck. Bluish gray breast. Pink underside. Resembles a Crow in flight. Inhabits coniferous and mixed forests, groves and scattered trees throughout west of the Great Plains to the Pacific, north to Alberta and British Columbia, east to the Big Horn Mountains of Montana and Wyoming, Black Hills of South Dakota and the Colorado Plains, south to Arizona and New Mexico. 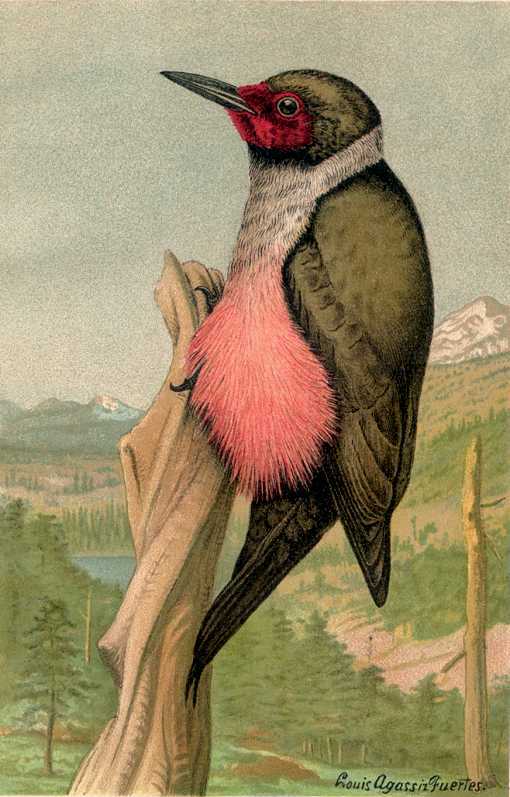 Lewis’s woodpeckers were identified by the Lewis and Clark Expedition near Helena, Montana in 1804. Unlike other woodpeckers, Lewis’s woodpeckers fly in straight paths with consistent laborious wing movements. They forage for insects under the bark of trees and catch them in flight. Also eat fruit and nuts. Like red-headed woodpeckers, they store nuts which they wedge into bark crevices and cracks. Females lay six to eight, more or less, white eggs which hatch after about two weeks incubation and young leave the nest in about another four weeks. They excavate tree cavities often in coniferous trees as much as two feet deep at heights from chest level up to extreme heights. The Lewis’s Woodpecker Birdhouse (same as for the Flicker, Pigmy Owl, Saw-Whet Owl, and Grackle) has a 7″ by 7″ floor, 16″ inside ceiling, 2 1/2″ diameter entrance hole located 14″ above the floor and ventilation openings. Secure a hinged roof with shutter hooks for easy access. Fill the box with wood chips, not sawdust. Mount this nest box 12 feet or higher on a tree at a forest edge, or grove. Other woodpeckers and owls also may use this nest box.